Reflect for a moment on the power of hearing in YOUR life. Then please help us share this message! Our hearing health is closely connected to our brain’s health. Since hearing loss becomes so prevalent as we age, we feel that the links between hearing loss and depression, mental fatigue, highlighted in recent studies are a big deal. Read the Research. Early detection may not prevent hearing loss, but it could help reduce some of its effects. We believe that together, we can make a difference. BENEFITS FROM OUR GIVE BACK PROGRAM? GREAT NEWS! 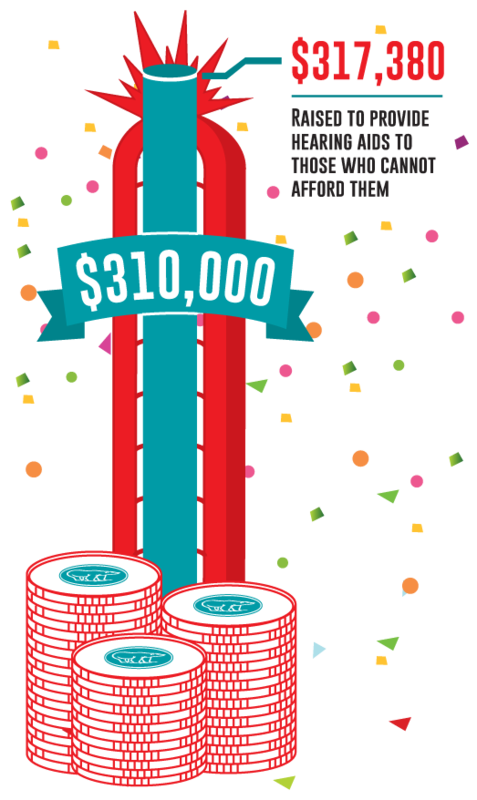 In 2018, we surpassed our goal of raising $310,000 as a result of our sponsor’s donations for use in providing hearing aids to members of our communities who otherwise would not have had access. We’re so happy for our hearing aid recipients, and so grateful to everyone who contributed to achieving this exciting milestone. 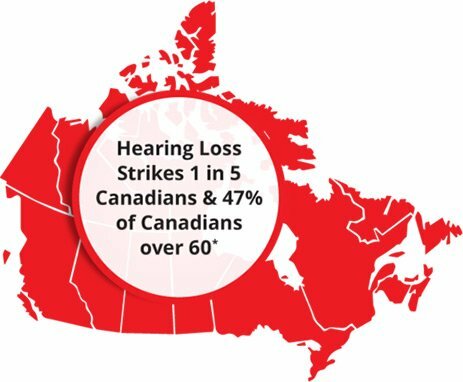 Last year, we’ve also managed to perform over 79,000 hearing tests across Canada, but our ultimate goal is to help EVERY Canadian over 60 get a hearing test. 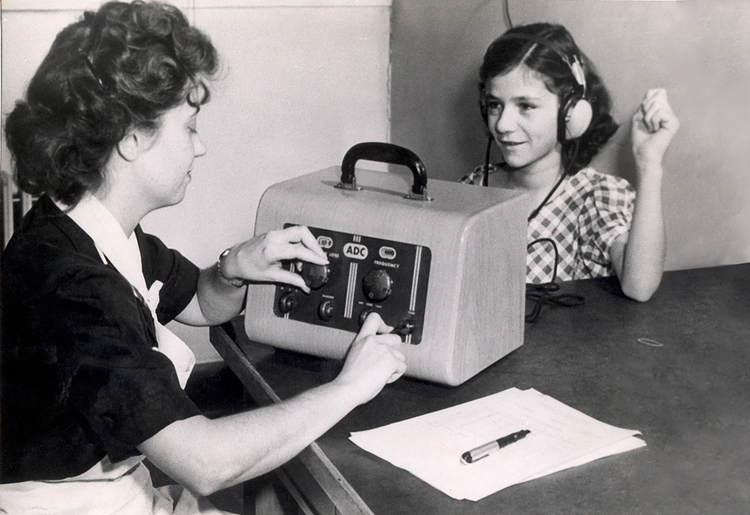 All we need from you is to get your hearing tested, and then get your friends to test theirs too. So please, request a test today! Pass the test, and pass it on. Hear the stories of those we were able to help. WAS YOUR LAST HEARING TEST? For too many Canadians it was in grade school. Hearing loss can be so gradual that others may notice a problem before you do. Our goal is to help ALL Canadians over the age of 60 get a FREE baseline hearing test and begin annually monitoring their hearing health. 1. Request an appointment to get your hearing tested. 2. Encourage your friends to get theirs tested too. Click to download the Refer-A-Friend card below and give them to your friends! CAN I HAVE MY HEARING TEST PERFORMED? 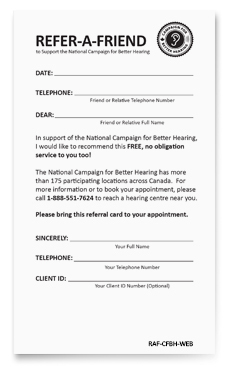 More than 175 hearing healthcare centres across Canada are supporting the cause. We hope you’ll join too! ENTER YOUR CITY OR POSTAL CODE to find nearest locations.